(c) to surrender to the authorized officer any item that the authorized officer believes on reasonable grounds is a prohibited item. The irony of this is that sworn police officers are themselves authorized officers under the Court Security Act, and bound to keep the peace and prevent offences against the law. Lawyers are officers of the Supreme Court (which has supervisory jurisdiction over inferior courts), yet they may not enter those courts where they challenge whim and caprice on behalf of their clients unless first subjected to a search seemingly based on merely following orders. My memory is that when this came in, the police were not routinely screened, and either the Law Institute or Bar (or perhaps both) pointed out that it didn't seem right that officers of the court were screened while police were not. So the solution chosen by the folks then responsible for court security was that all should be screened! I'm not concerned just by the symbolic damage done when these central players in the justice system are treated as suspect by the very courts they serve. It's also the arbitrary nature of the searches and the exercise of powers by authorized officers that rankles. I've had to surrender a penlite torch at some Magistrates' Court venues, and the always at the Supreme Court — presumably in case I shine someone to death. Some require I surrender an umbrella; others don't. (I can see some sense in this one.) A colleague of mine was once required to open his wallet for inspection: I'm not sure how many lawyers have smuggled contraband into courts in the last decade, let alone in their wallet, but I reckon I'm on fairly safe ground speculating the number is pretty low! Now of course, some might point out that it's possible to use a great many items as weapons. For example, a small torch might be used as a kubotan — one of several prohibited weapons in Victoria. Heck, even pencils and pens can be used as weapons. But common sense usually prevails, and if there's no indication that a person is going to use an ordinary item as a weapon, the court security guards normally don't worry about them. (9) An authorized officer may refuse a person entry to the court premises or remove a person from the court premises if the authorized person believes on reasonable grounds that the person is likely to affect adversely the security, good order or management of the court premises. (c) the good order or management of legal proceedings or other business conducted at the court premises. I still reckon that without evidence I intend to use a torch as a weapon, or wreak havoc with the contents of my wallet, there's no justification for surrender or search of such items. These broad interpretative provisions don't seem to bestow power on authorised officers to intervene for reasons other than the security, good order or management of the court premises. So I was surprised and concerned to hear recently of an instance when a lawyer was told by an authorised officer that the lawyer wasn't allowed to use their iPad while sitting in the body of a court room, and could only use it while at the bar table, and would have to either turn off their iPad or leave until their case was called. I've heard of similar directions occuring at at least one other venue of the Magistrates' Court, so although this seems isolated, it's not a one-of occurrence either. I could understand it if someone — anyone — were playing loud music, games or video. (That might well fall within the scope of the court's contempt powers anyway, as interfering with the course of justice and interrupting proceedings: Hancock v Lynch  VR 173.) But quietly reading notes, email, calendar appointments, checking legislation? How does that interfere with the security, good order of management of the premises? Judicial officers on the other hand have absolute authority about security in the court, extending to jurors, witnesses and even counsel and solicitors in a case: R v Smith  2 NSWLR 608 at 616 – 7 per Street CJ; Murray v Flack (1983) 6 A Crim R 394; R v Benbrika (No 12)  VSC 524. So long as a lawyer's use of an iPad — or anything else — interfered with the proceedings, the presiding judicial officer could deal with it. But short of that, I can't see any reasons they would, and more to the point, why authorised officers under the Court Security Act should be concerning themselves with such things. It might be a mild annoyance for some, but I know for me and some other lawyers, it would be equivalent to depriving us of access to our brief, and everything else essential for our practice. I understand the Magistrates' Court at least is in the process of making a policy on this, and if it does, it probably won't be too long before other courts do too. I hope so, and that in the meanwhile, common sense prevails. 1. How are you going to prove the identity of a lawyer? Exempting from search anyone wearing barristerial robes or a suit is an example in profiling and would risk undermining security of the court. Granting a blanket exemption to those showing an LIV membership card (or equivalent from VicBar if there is one) might work, but could equally be ineffective. Personally, I find going through court security an annoyance, but its hardly an affront to my dignity or the dignity of the court. 2. On the iPad issue, I wonder if this is at all connected to the, in my view, absurd and arbitrary restrictions sometimes imposed on live tweeting of court proceedings (e.g., the concern abourt Margaret Simons live-tweeting parts of the Artz committal). How do you prove you are a lawyer to get into the police lockup or jail to speak to your clients? Whatever works there should work just the same at the courthouse. In the States Bar Associations issue photo identification. At Sunshine Magistrates' Court I have had a replacement bike tube, allen keys and a spanner checked in because they could be used as weapons. My objection to this characterisation led to a PSO telling me to comply or leave. I complied in the interests of the client. It strikes me that a can of Coke, purchased from the vending machine in the Court foyer, would make a far better weapon. I also object to the manner in which security guards conduct body scans with their metal detection wands. Many guards use the wand without due care and continually bump it into me, sometimes getting the wand caught on buttons. Ambulance Officers are the most trusted profession, Police and more so Solicitors are way down on the list? so what about Ambulance Officers, or Firemen? what about off duty? what about when Officer is appearing themselves (civil matter, family law) the list goes on, I can get a real neat ceramic knife past any Court Security screening, so why do they bother? it beats me. Caen, I think the easy answer is to to rely on ID cards. 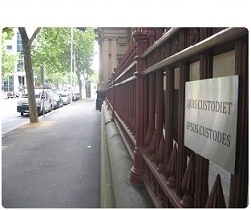 The police have them, and the LIV and the Victorian Bar issue cards to their practitioners. I'm not to worried about my own dignity — I've had to many snafus in my time for it to be an issue! — but it still strikes me as odd and almost perverse that the mainstays of the system aren't trusted (apparently) by the system. The arbitrary nature of it is shown in the things sometimes required to be surrendered. I recently had to hand it a glass bottle bought for a colleague inside before I could get in to the County Court. Presumably they were concerned it might be used as a weapon. So, we just drank water from the glass cups and jug on the bar table in the courtroom! We trust soliders with all sorts of weapons, we give police handguns, but these people are not trusted to 'carry' of duty? does the uniform change one? Its all about PEOPLE CONTROL not CRIME CONTROL! Russell St, Walsh St, Hoodle St, Queen St........let's not have William St added to this list! As a Melbourne based solicitor who attends one of the CBD courts 3 to 4 times a week it is of some comfort that all persons are being scanned before entering. Like I said Solicitors are way down on the list of 'trusted profesionals' having said that scanning them serves NO purpose and any 'comfort' gained is FALSE, a person with INTENT can easly get a ceramic knife in or just drive a pen into your eye socket, If laws could solve crime, we would not have any crime at all, and the very persons who obey the law are the ones we need to fear the least.